Thank you to all of those who entered our Salute To Veterans Giveaway! We received so many amazing entries and stories, it was hard to choose one winner! Congratulations to……Jeff & Bronwyn from Fairborn, OH! Bronwyn proudly nominated her husband, Jeff, in our giveaway; she shares with us that he dedicated 28 years to serving our country in the Air Force, entering at the age of 17. Within his time in the Air Force, Jeff rose from an Airman to being promoted to a Chief Master Sergeant, holding 5 positions as a Command Chief that included being among the first into Iraq during the war in 2003. He supported and cared for so many service members and their families through the years, that they continue to cross paths today, even 9 years after his retirement. Jeff currently extends his involvement by running an Air Force Educational program at the local base. With his experience in the Air Force, the insight and advice he provides to his active duty and civilian students is truly immeasurable. 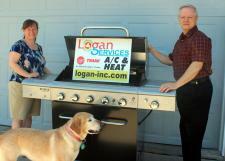 We delivered the brand new grill last week, and we got a BIG SURPRISE! Bronwyn herself is also a veteran! We feel so lucky to have found such kind, deserving winners! THANK YOU JEFF AND BRONWYN FOR YOUR SERVICE! Be sure to take the opportunity to pay tribute to the men and women who fought to defend our freedom and liberty this Memorial Day. Their bravery and sacrifice will not be forgotten. LIKE US ON FACEBOOK to stay informed about upcoming giveaways!